Swillburg’s Big Party: Thursday, October 8 – Welcome to Swillburg! Swillburg’s throwing a party. A really, really cool party. And we want you folks to come. 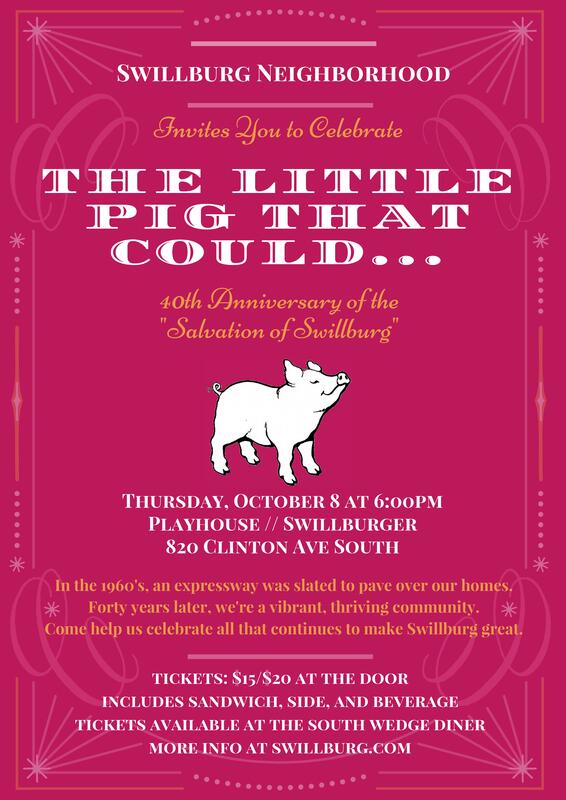 We’ll be celebrating the 40th Anniversary of the “Salvation of Swillburg” – when community leaders and neighbors led a fight to preserve our urban hamlet – at the new The Playhouse // Swillburger. Great food, drinks, memories, fun, and, of course, the best neighbors in Rochester. Save the date: Thursday, October 8, at 6pm. Tickets: $15 ($20 at door), and will be sold by your neighbors in the Swillburg Neighborhood Association and by our friends at the South Wedge Diner. More details, as always, available for Swillburg residents on swillburg.nextdoor.com. Ticket price includes a choice of sandwich, side, and beverage.